Sure, Donald Trump built a real estate empire. But George Clinton of Parliament Funkadelic has built an empire of funk and he has this to say: "No funk in da’ Trump." Clinton, the musical impresario who founded P-Funk in a barbershop in Plainfield, supports Hillary Clinton (no relation!) for president and is strong in his opposition to Trump. Clinton stressed the importance of getting out to vote. “Even if you if you don’t want to vote, it ain’t more twisted than that,” Clinton said. "You have to get (blanked) off at this point"
George Clinton decided to voice his support for Hillary Clinton and his opposition to Trump after the tape from a 2005 “Access Hollywood” broadcast became public where Trump lewdly referenced grabbing women by their private parts. George Clinton performs at the 2015 National Association of Music Merchants show at the Anaheim Convention Center on January 23, 2015 in Anaheim, California. George Clinton became involved in the election talk in a circuitous way. A satire column earlier this month in the New Yorker by Andy Borowitz portrayed Donald Trump attacking George Clinton with a series of P-Funk references. Some Clinton fans thought it was real. Since then, he's sold "No funk in da’ Trump" T-shirts. George Clinton has never met either Trump or Hillary Clinton, but he did play the Youth Ball at the first Bill Clinton inauguration. Bill Clinton walked on stage during P-Funk rendition of “I Call My Baby Pussycat,” according to George Clinton’s autobiography, “Brothas Be, Yo Like George, Ain’t That Funkin’ Kinda Hard on You? : A Memoir.” Later, he meet Chelsea Clinton after a concert. She wanted to have a food fight. “It was on my birthday,” Clinton said. George Clinton joins Jersey rockers Bruce Springsteen and Jon Bon Jovi in their support of Clinton and opposition to Trump. Springsteen told Britain’s Channel 4 News that Trump will lose and is such “a flagrant, toxic narcissist that he wants to take down the entire democratic system with him if he goes.” Bon Jovi will perform at Clinton’s “Love Trumps Hate” rallies Thursday, Oct. 27 in Pittsburgh and Nov. 5 in Tampa, Fla. 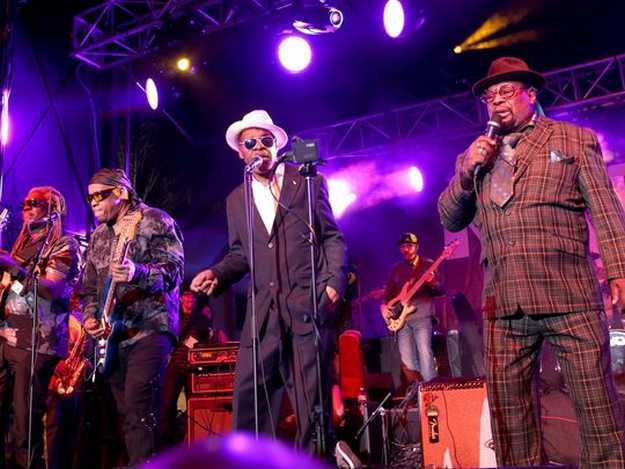 In Washington, D.C. , the P-Funk Mothership, which Clinton formerly flew onto concert stages, is part of the hit Smithsonian National Museum of African-American History and Culture. “That’s capping the whole reinvention of myself,” Clinton said. “I’m fighting for copyrights of my music, with the Mothership being there, the book coming out, winning the Grammy with Kendrick Lamar (for ‘To Pimp a Butterfly’), it’s all giving a chance to shine the light on what’s really going (with copyrights). It’s unbelievable." The rave-reviewed “Brothas Be, Yo Like George,” release in 2014, partly details Clinton’s copyright battles against Bridgeport Music, the owner of Clinton’s work between 1976 and 1983. Clinton said he’s now working on a documentary about the situation.